Universal healthcare is not a new or controversial idea. Eight presidents, Republicans and Democrats, wanted to expand health care to all Americans. All modern nations except the US have some form of Universal coverage. Nixon said: "I shall propose a sweeping new program that will assure comprehensive health-insurance protection to millions of Americans who cannot now obtain it or afford it, with vastly improved protection against catastrophic illnesses." 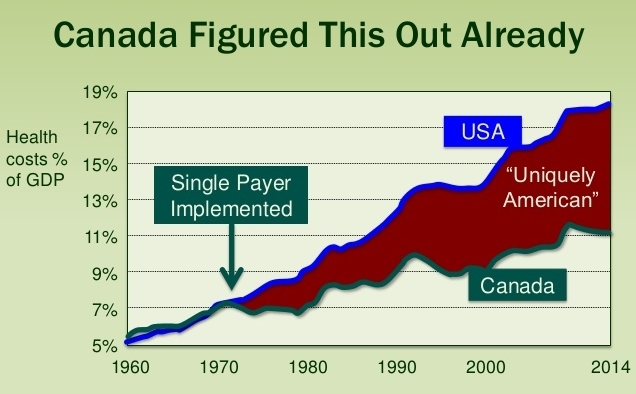 Canada enacted a universal healthcare program in 1970 that has enabled their country to control the cost of healthcare for both consumers and government. Medicare-For-All is single-payer coverage based on expanding Medicare to include all age groups. this approach is used by Australia. Imitate success: Nations with universal coverage have greater accessibility to care, that is more affordable, and yields better outcomes. These nations enjoy more equitable treatment, higher life expectancy, lower infant mortality rates, and fewer deaths from treatable illness. It seems prudent, given the positives of far outweigh the negatives in comparative studies, for the US to implement universal healthcare coverage. Medicare is well-liked and successful, it seems logical to expand this efficient and effective system, used by our seniors, to include everyone. 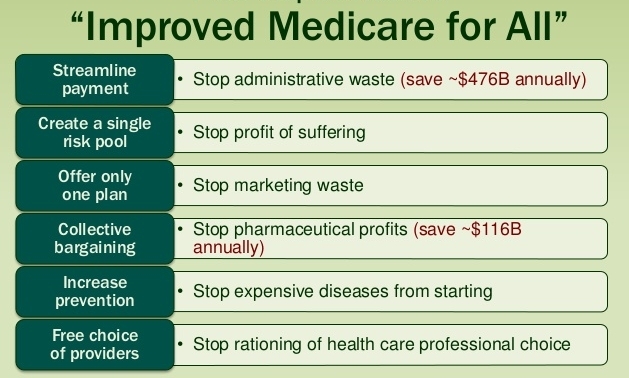 Saves money: Due to lower administrative costs, the elimination of duplication, less waste and fraud, the savings from more timely treatment, and price controls, it is estimated Medicare for All could save US taxpayers as much as $17 trillion in health care spending over a ten-year period. It is estimated that it would reduce federal deficits by up to $400 billion annually. 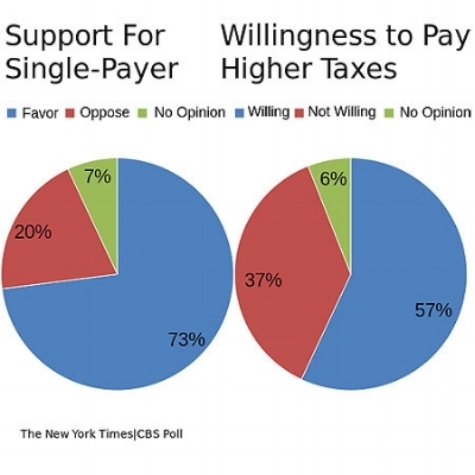 Helps business: Because the US government already pays nearly two-thirds of total health care spending, only a small tax would be needed and businesses that buy into Medicare for All would save money by reducing their insurance costs. Boost the economy: Implementing Medicare for All would help balance the federal budget, save tax payers billions of dollars in lower health care costs, help small business, and improve overall health and productivity providing a tremendous boost to our economy. At 515 pages the Senate version of the Republican tax-reform is 86 pages longer than the House version. Clearly this legislation is not designed to simplify the tax-code. The federal government is currently operating in the red to the tune of over $700 billion this year. All reputable analyst project the legislation will add over one trillion dollars to the debt. The national debt is already at a record peace-time high and interest is 7% of mandatory spending. Clearly this legislation is reckless and fiscally irresponsible. The economy is cruising along at a modest and healthy 3% growth rate. Unemployment is at record lows and wages are on the rise. The stock market is in the stratosphere, having tripled since the 2009 lows. In July S&P projected that US companies will post record profits for 2017. The only sour notes in the economy are rising personal debt, the cost of healthcare, and the growing disparity between the richest and poorest Americans. This legislation throws fuel on the fires of irrational exuberance while dousing the hope of solving serious economic concerns. Clearly this legislation a dangerous attack on the stability of the US economy. Give people more money to spend? This legislation addresses individual income tax and corporate taxes. It does not address payroll and self-employment tax. 45.7% or almost 78 million tax-payers pay no individual income tax. Doubling the standard deduction will increase the ranks of those not paying any income tax to over half of all tax payers. 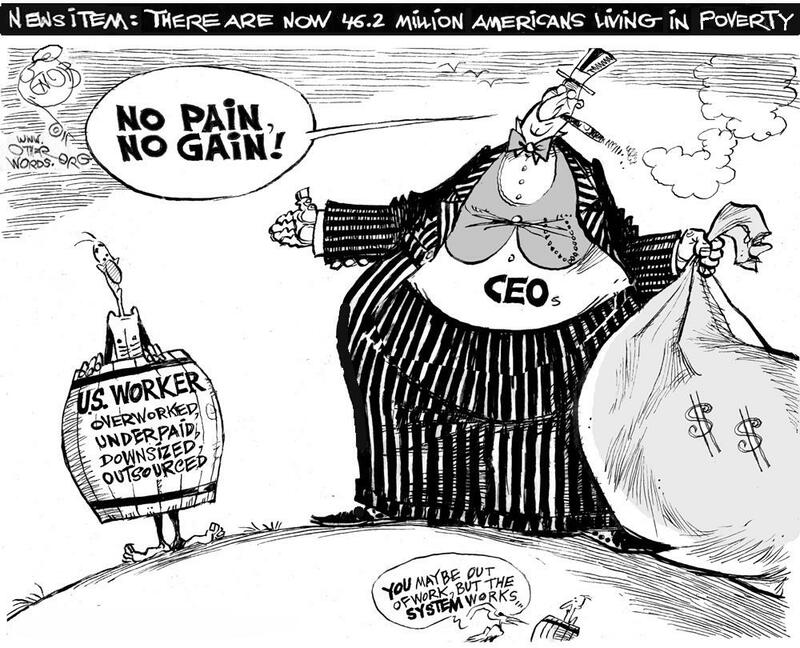 Effectively those Americans making the median income or less will pay no income tax. But since few do now, this will have negligible impact on reducing middle income taxes. Projections are that those families making between $50,000 and $100,000 may see an average of maybe $50 per month in their take-home income. But most of that will be erased by higher insurance premiums resulting from ending the mandate, and the elimination of other popular deductions. Clearly the promise of more money for the middle class is exaggerated at best. Republicans claim lowering the corporate tax rate from 35% to 20% will encourage business to expand in our country which, in turn will increase wages and improve employment. But surveys of business owners indicate they will use the savings to buy back stock and pay down debt to increase capitalization rather than increase wages or hire more employees. Another relevant fact is that in 1952, corporate income taxes accounted for 33 percent of all federal tax revenue and today, despite record-breaking profits, corporate taxes bring in less than 9 percent. 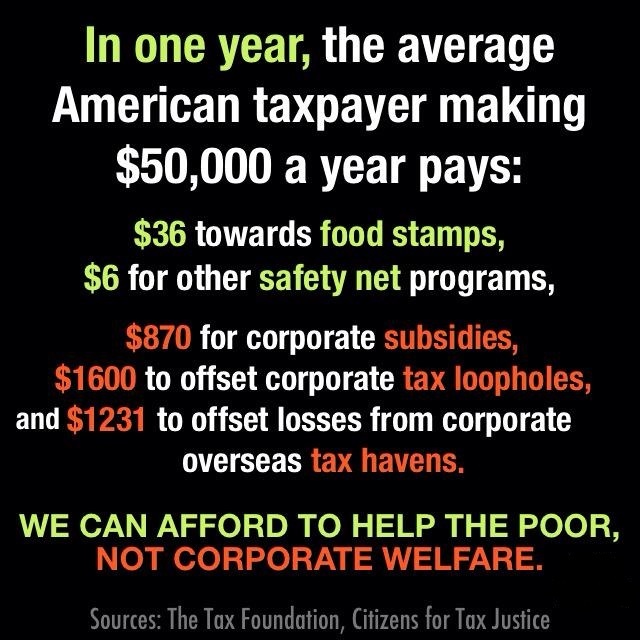 Clearly, government taxation of corporations is not a problem that needs fixing. Reagan cut taxes and regulations, the national debt tripled, and we went into recession before Congress raised taxes. GW Bush cut taxes and deregulated financial markets, and we went into the great recession and are still experiencing enormous deficits ($700 billion this year). Both of those presidents used the same trickle-down rhetoric being used today to scam the American public into believing a lie. If this tax-cut package passes, a severe recession will soon follow, and federal deficits will reach new highs. 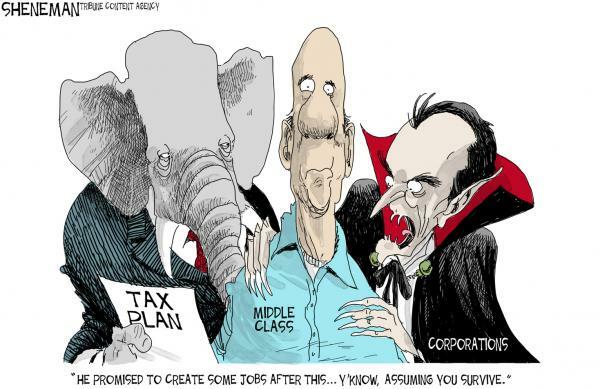 Clearly, "voodoo economics," as George H Bush called it, is economy destroying policy. Drown government in a bathtub? 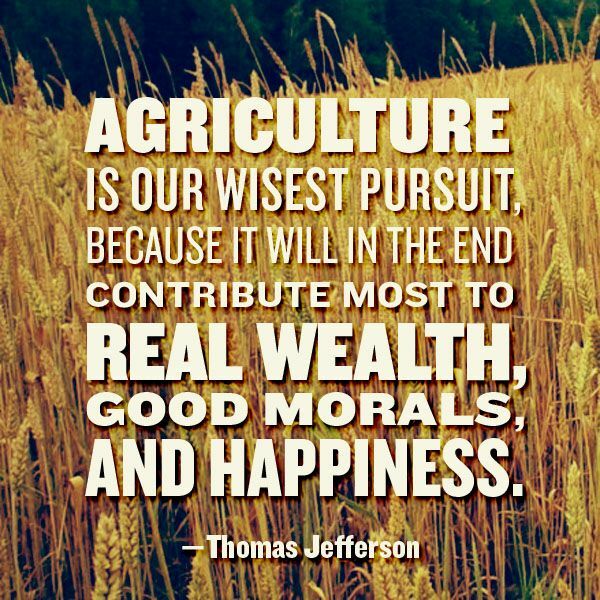 Clearly, this is the agenda of a wealthy elite and political insiders to bankrupt government. What's Your Position On Abortion? I'm running as a Republican, so I was not surprised to be asked this question. 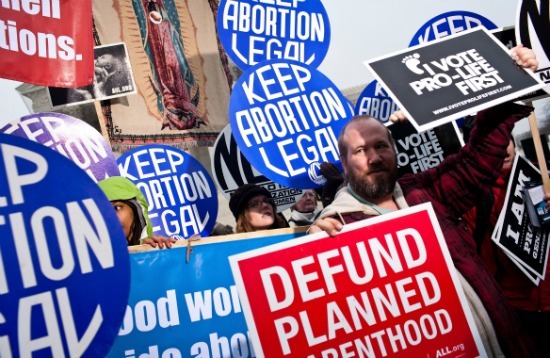 Abortion has become the most contentious and divisive of all political issues. As a centrist, my desire is to help people find common-ground or, at least, find a way to have a reasoned and civil discussion of the issue. I'll begin by discussing some basic truths. Abortion, along with birth rates and unintended pregnancy, has been declining, for decades. The most recent data shows the abortion rate has fallen to historic lows. The cause of this huge drop in abortion is the availability of better contraceptives. In 1974 the conservative Supreme Court in the Roe v. Wade decision effectively legalized first trimester abortion in the United States. Unless Roe v. Wade is overturned, laws restricting or denying women their right to an abortion is unconstitutional. It is also counterintuitive to restrict access to abortion since study after study shows such restrictions are ineffective in lowering abortion rates. It makes more sense to get behind successful practices like expanding access to long-term contraceptives and family-planning information. Pew regularly surveys public opinion on Roe v. Wade. The public has accepted the legality of first trimester abortion and that public acceptance has grown stronger over time. Consequently there is no political will to attempt criminalization of abortion. It would be political suicide for any party that succeeded in reversing Roe v. Wade. I am personally opposed to abortion as a form of contraception but understand criminalization is not a deterrent, can result in unhealthy outcomes, and does not have public support. Therefore, I am an a strong advocate of public programs to expand access to long-term contraceptives and family-planning information. A responsible, compassionate society would do everything reasonably possible to help women avoid unintended pregnancy and support the health, welfare, and education of all children. Those who fail to advocate for the freedom of others will soon lose their own. I'm running for US Congress in the Republican Primary. I believe, now more than ever, I must assert that I am a staunch advocate for my many friends, relatives, and others in the LGBT community. I'll give political justification for my support for the LGBT community, but the truth is, it is my heart, not my head, that guides me on this issue. I've seen too many great, loving, and kind people whom I deeply care about treated unfairly. I will do everything I can to put an end to the bigotry, hate, bullying, and discrimination directed toward them. I strongly believe in the principle that "Government will not harm a human or through inaction allow a human to be harmed!" I will fight any legislation that harms LGBT people even if such legislation is disguised as "protecting freedom." There is no rational reason to single out LGBT people and religious exceptions are bogus and violate the First Amendment. Government's duty is to protect us from harm, not provide cover for those who would do us harm. 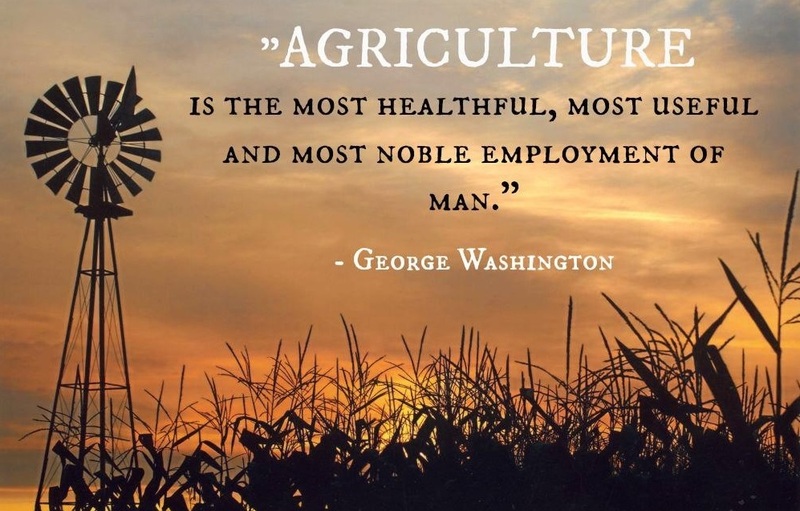 There are two significantly different and competing visions for American agriculture today. I am often asked whether I believe the accuser or the accused? It's not fair to ask such a question. Should I side with the pretty young blond or the scrubby black man? I believe there are three sides to every story. There is the side told by the accuser, the side told by the accused, and the truth. I want to believe the truth. When the truth is unknown, I cannot side with the accused nor the accuser. It is well known that everyone accused of wrongdoing denies guilt. It is just as well known that eyewitness testimony is unreliable and false memories are common. What people say is just as likely a lie, or incorrect, as valid. I would rather see a guilty person go free than an innocent person be condemned. I believe in "innocent until proven guilty." We seem to have developed a social justice system where the most popular opinion is deemed truth. It is deeply disturbing to me that the fate of a human being might be determined by the number of Facebook "likes." Recent polling found some disturbing uncertainty among Americans regarding the sexual abuse issue. Eighty percent of Americans believe sexual abuse is pervasive in our society. An equal number believe false accusations are commonplace. A third of women worry they will be a sexual abuse victim. An equal number of men worry they will be falsely accused. Everyone, including the media, must STOP inciting lynch-mob mentality, step back, and look for truth. is, and ought to be, a core commitment of conservatism. It is consistent with the virtues of good stewardship and frugality in that it minimizes waste of resources and maximizes care of creation. It's not surprising that so many faith groups support renewable sources. A modern nation's economy runs on energy. As technology advances, 19th century energy sources become less viable in terms of human health, the environment, money, and reliability; because, new energy sources like wind and solar are emerging as cleaner, safer, cheaper, and more reliable. These new energy sources are not only more viable but add energy supply to feed growth and the fast growing new energy industry is creating new jobs and new business opportunities. The U.S. installed 2,387 megawatts (MW) of solar PV in Q2 2017 to reach 47.1 gigawatts (GW) of total installed capacity, enough to power 9.1 million American homes. The solar industry employed 260,077 workers in 2016 an increase of more than 51,000 workers (25%) over 2015. Neither, however, could have imagined that stateless, trans-national corporations would dominate every aspect of modern cultural, economic and political life. Equally unimaginable to each would be that America's citizens would have so passively accepted such a condition. The old maxim of the law is drawn from reason and justice...They who feel the benefit, ought to feel the burden. No better standard can be cited for the foundation of a fair system of taxation. However, present policy and proposed "reforms" offered by Congressional leaders simply further invert the relationship between the ability to pay and tax incidence. The current IRS code is a bloated and arcane set of documents that serves as full employment program for tax attorneys and accountants but fails to serve the public interest. The federal tax code is the purest example of the power of big-money special-interests to purchase, or rent, government for their own private benefit. It is a direct product of the corrupt pay-to-play campaign financing scheme that distorts policy making. Fairness. Fairness requires that persons with similar incomes and assets should be taxed alike. Fairness also requires that those who have more should pay more than those who have less. Simplicity. A tax system is unsuitable for a democratic republic if it cannot be understood by the taxpayers themselves. Our present tax system is exceedingly complex and demands simplification. Fiscal Goals. A tax system should be used primarily to raise revenue. It should not be used to subsidize business activity or to influence personal conduct. Efficiency. Tax deductions, credits and exclusions usually confer their greatest benefit on wealthier persons and give little or no help to those who are desperately in need. The most efficient way to implement government programs is through direct appropriations, which are subject to annual budget review, and which relate benefits to needs. Tax subsidies should be rejected because they waste scarce government resources and are seldom subject to budget review. Burden Shifting. When tax breaks allow others to escape their fair share of the tax burden, others have to pay more to make up the difference. This shifting of tax burdens is an important source of the unfairness in the federal tax system. It must be halted. There is much discussion, and argument, regarding proper respect of the symbols of the United States. However, there is far too little understanding of what genuine patriotism, grounded in the values of the Founders, actually means. 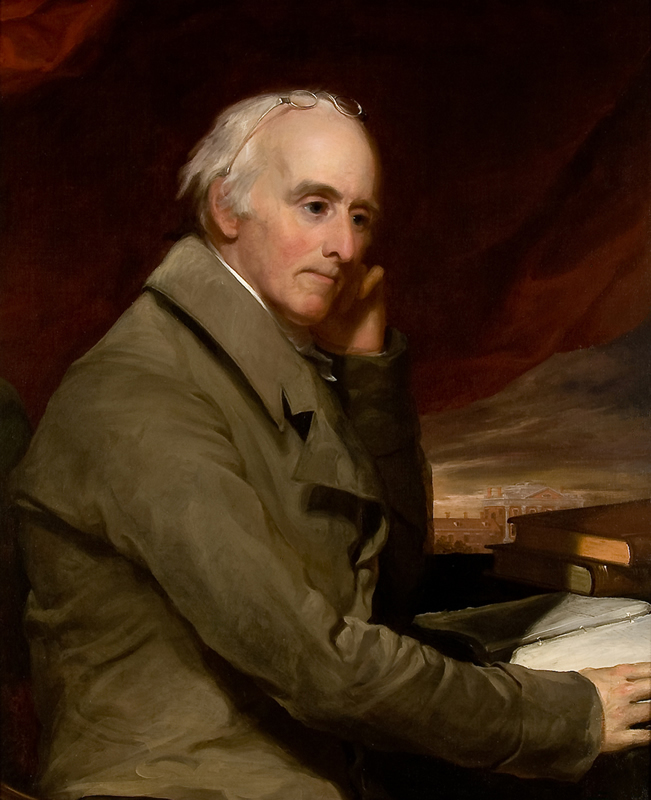 Nothing is more certain that the forms of liberty may be retained, when the substance is gone. Stain not the glory of your worthy ancestors. 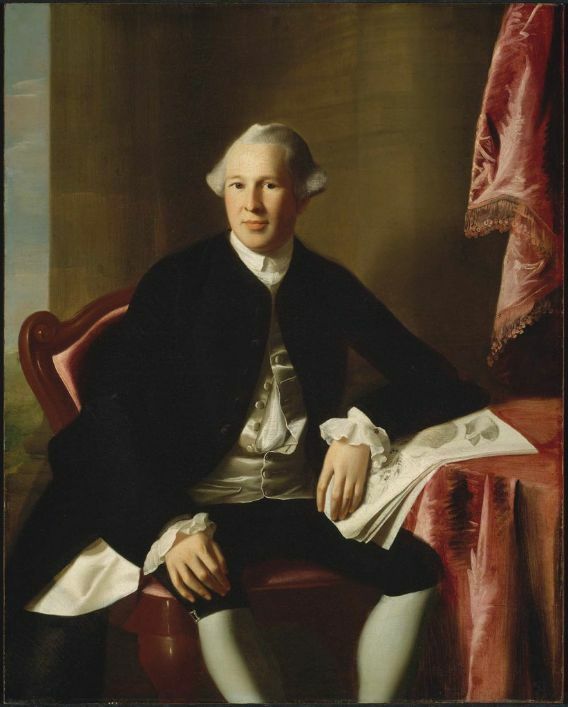 but like them, resolve never to part with your birthright, be wise in your deliberations, and determined in your exertions for the preservation of your liberties. Follow not the dictates of passion, but enlist yourselves under the sacred banner of reason; use every method in your power to secure your rights. I believe "fair taxation" demands that "all income sources" be included in the income tax code. I would tax inheritance as unearned income and treated it similarly to long-term capital gains. Rather than using "step up," I would adjust the basis for inflation to calculate "real growth" as opposed to inflated "nominal" value. I would compromise on a modest "base deduction" for inheritance. Current drafts of various tax "reform" bills entail elimination or, at minimum, sharp limitation of estate tax provisions. In recent years, this form of taxation has been routinely caricatured as the 'death tax' by opponents. 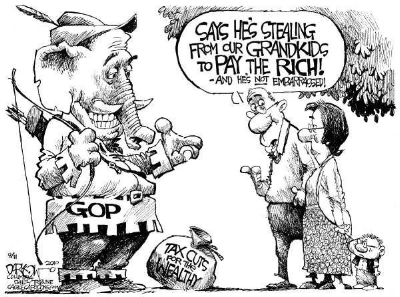 But a proper understanding of this tax is that it is an aristocracy or plutocracy tax intended to prevent multi-generational concentrations of wealth and power. 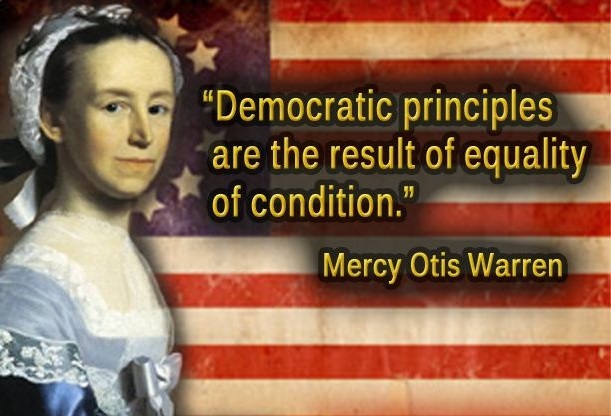 The Founders understood this to be fundamental to the preservation of a democratic republic. 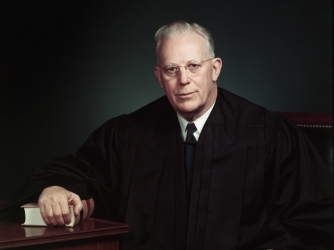 "An equality of property, with a necessity of alienation, constantly operating to destroy combinations of powerful families, is the very soul of a republic--While this continues, the people will inevitably possess both power and freedom; when this is lost, power departs, liberty expires, and a commonwealth will inevitably assume some other form." I believe the Federal Minimum Wage should be set equal to the inflation adjusted 1968 minimum wage ($11.12) and adjusted annually based on CPI data. I believe states and municipalities should retain the right to set their own minimum wage equal to or higher than the federal minimum adjusted for regional cost of living. I worked my way through college, 1966-1970 on minimum wage jobs. 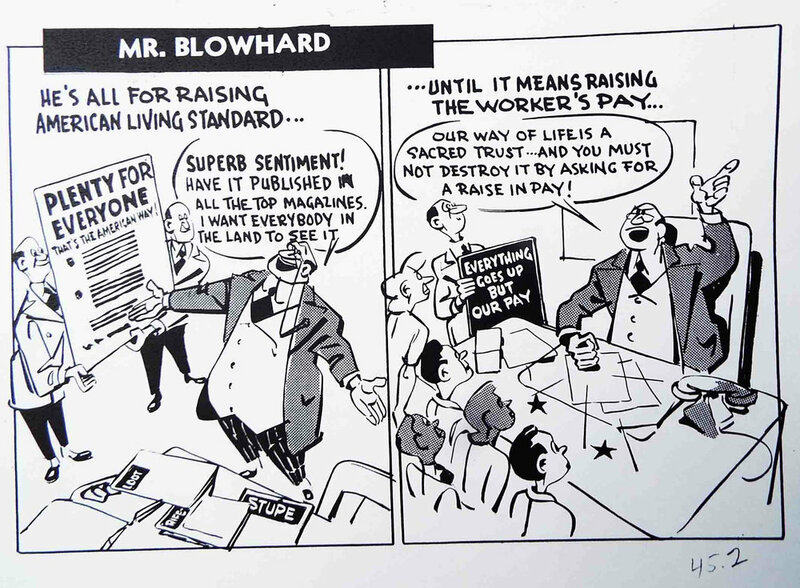 The minimum wage has been around since 1938 in the US and is used in all modern countries. It has been raised 34 times and nearly all states and many municipalities have their own minimum wage. While it is a hot partisan topic with economists lining up on both sides of the issue, it's widespread use and historic data seem to indicate more positive than negative results. Card and Kreuger make a strong defense for setting a wage floor. They show results from natural experiments, like their New Jersey study, indicate hikes to the minimum wage do not lead to a fall in employment. 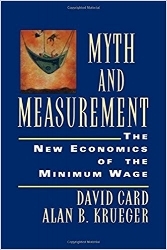 In fact, they claimed, a number of studies showed that the minimum wage had a positive effect on employment and economic growth with little impact on business success or poverty. A large majority of Americans, about 75% in most polls, indicate they favor raising the minimum wage. Americans favor a moderate increase now with automatic increases tied to inflation. 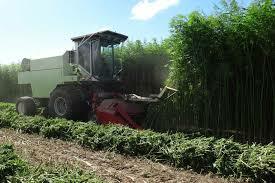 Industrial hemp is a genetically distinct variety of cannabis sativa banned in 1937 and further restricted in 1970. It is a competitive source of paper, biofuel, plastic, and other products. In 2014 $620 million of hemp products were imported into the US that could have been produced here if not for the ban. A substantial majority of Americans see money in political campaigns is generally detrimental. 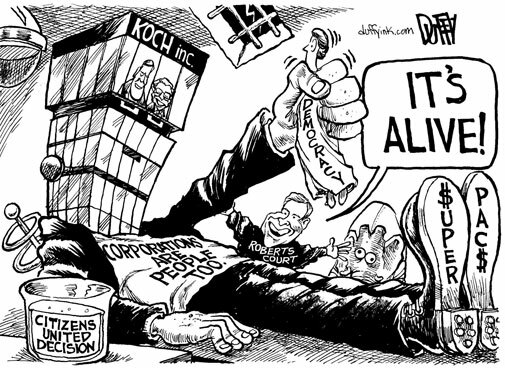 The 2010 Supreme Court ruling, Citizens United, has gotten a lot of attention lately and for good reason. Unlimited donations by the wealthy elite and corporations to super PACs have drowned out the voices of ordinary Americans. Money influencing voters comes from dark sources, out of state and even out of the country. Money spent for and against candidates is greater outside campaigns than inside, giving candidates little control over the trajectory of their own campaign. We are powerless when we vote for money. Representatives who won because of big-money have no incentive to legislate changes limiting campaign spending. Our power lies in voting against the money. 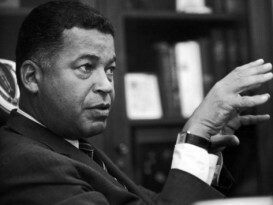 In Missouri, the revival of the Republican Party began fifty years ago when reformers like John Danforth and Kit Bond challenged entrenched and corrupt state leadership. At the time, such figures represented moderate-to-liberal electoral alternatives. 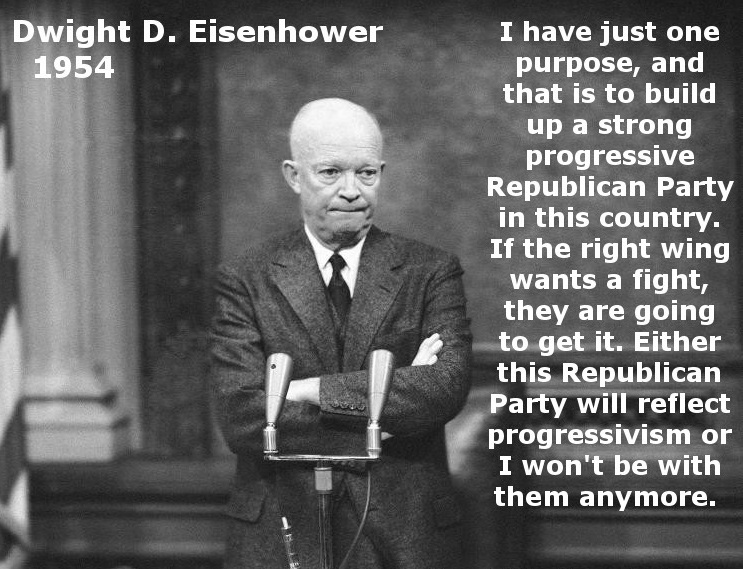 Tragically for all of us, the national and state Party no longer reflects this heritage. Today, the GOP has become captive to ideological extremists, such as so-called libertarians and neo-cons, whose agenda bears no relationship to this progressive legacy and whose adherents bear no allegiance to the Party’s history. This campaign seeks to honor this history and heritage of the GOP while calling for the Party to again reclaim its rightful role as an agent of positive change in our country. America's Founders understood that a democratic republic could not be sustained if conditions of vast inequality were allowed to persist. Yet today, disparities in wealth have reached unprecedented levels. 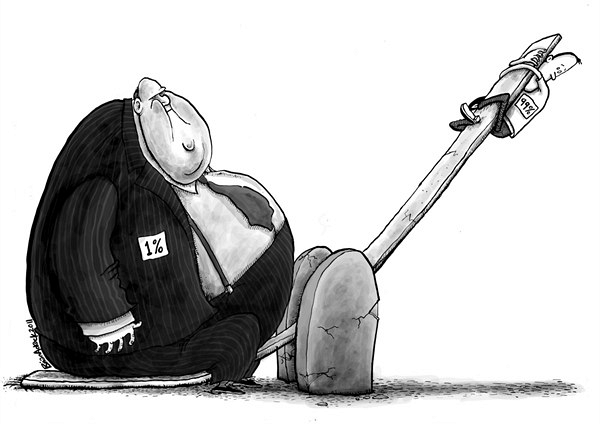 Just three persons in our country possess more wealth than half of all Americans. There was a time, right after WWII when the US understood the value of a productive well-paid workforce and consumers with money to spend. In the mid-fifties we had a growing robust economy, insignificant deficits, were constructing national highways and a national utility grid, union membership stood at 35%, and the top marginal tax rate of 91% that encouraged reinvestment. I'm not sure why balanced budgets and widespread prosperity lost favor and elected officials shifted their focus to punishing workers and exploiting consumers to reward big transnational monopolies.